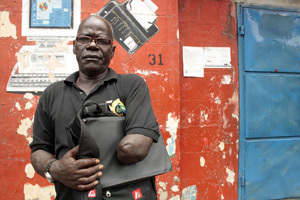 FREETOWN (IRIN): James Ponbu, 43, had his arm amputated by rebels in January 1999. After receiving medical treatment at the Connaught hospital in Freetown, he tried to return to his job at the canteen of Fourah Bay College but was not accepted back. He has found it hard to get work ever since, despite having a college degree. Even his friends shun him: “People barred me from entering their compounds as they thought I’d just ask them for money,” he said.Cutting off peoples’ limbs – in most cases their hands – was one of the brutal strategies used by members of the Revolutionary United Front to terrify people to support them. Some 27,000 Sierra Leoneans are estimated to have been disabled or have had one or more of their limbs amputated during the 1991-2002 civil warIn 2004 the Truth and Reconciliation Committee (TRC), set up to try to deliver accountability for human rights abuses, issued a report recommending that amputees, war widows, children, victims of sexual violence and the seriously war-wounded, should receive reparations in the form of free education for children, free health care and skills training to be managed by the National Commission for Social Action (NaCSA).Since then of the 32,000 people registered, 20,107 have received only a cash handout of between US$70 and $200, and 12,000 have received nothing at all. The amputee association has pressured the government to act on the TRC recommendations, but to little avail, said chairman Ngobeh. In May of this year the Ministry of Social Welfare did a survey of street beggars in urban areas, many of whom are amputees, with a view to advocating more help, according to the Social Welfare Ministery. Victor Vandi, 37, is a single-leg amputee. A father of eight, he works as an electrical and radio repair-man – a trade he began before the war. He also plays as a midfielder in Freetown's amputee football team. NaCSA gave him $200 and also built him a house. "Four men were killed in front of my eyes. I still feel traumatized whenever I think about it… They saw I was strong, so they pointed guns at me, kicked me to the floor and stood on my hand. Then they cut my arm off with an axe." "After it happened, I went to stay at the Aberdeen amputee camp. I said to myself, 'What can I do now? I can't go to the streets and beg. I was a self-made man.' I knew I couldn't do mechanics again. So I decided to do photography – I would photograph marriages and go around the city taking portraits. But I don't do that any more because the photos don't come out well – my hand shakes." "Three hundred thousand leones [$70] will not take you anywhere these days. In education, or even for health care, it can’t take you anywhere… The government really is doing nothing now. The money we received was from the UN peacebuilding fund. The Lomé [peace agreement] said the government and international community should do something for us. "If anything, I want to see our children educated – very few children of amputees go to school. Outstanding blog keep up the great effort, thanks for the information, I will pass your blog on to my friends. Amputees need help. They are not responsible for their predicament. It could be anyone. Let's pressure government to do something for amputees.